This Data Set Says a Recession Could Be Coming to the U.S. This Data Set Says Recession Could Be Nearing for the U.S.
Home » U.S. Economy » This Data Set Says Recession Could Be Nearing for the U.S.
A recession could be nearing for the U.S. economy. There’s a lot of data backing this argument, so beware if you have too much money in the stock market. The data set that investors should pay the most attention to is personal income figures. These numbers aren’t really being reported in the mainstream media these days. Personal income statistics alone say a recession could be in the making. When President Donald Trump announced tax cuts for corporate America, it was widely believed that they would trickle down to average Americans in the form of salary increases. At that time, it made sense. The idea was simple: corporations would have more money and they would reward their employees. For American companies, the tax cuts were great. We saw their profits surge immensely. Sadly, the tax cuts weren’t as great for the average Joe American. The chart below plots the year-over-year percentage change in personal disposable income, adjusted for inflation. Keep in mind that disposable income is what’s left after taxes and other charges, and pay close attention to what happened between mid-2017 and now. Since mid-2017, the income growth rate in the U.S. economy has been flat. Why Worry About Disposable Income? Remember that the U.S. economy’s growth is highly dependent on its consumers. If consumer spending declines, a recession follows. If disposable income isn’t increasing, it’s hard to see consumer spending increasing. Eventually, this situation will hurt U.S. growth rates, and a recession could become reality sooner rather than later. It wouldn’t be shocking if a recession becomes reality in late 2019 or early 2020. We are already seeing inflation pick up in the U.S. economy. Inflation causes massive impacts on the way consumers behave, as they use their income to buy less. What’s in it for Investors? Over the past two years, consumer discretionary and related companies have had a really good time, their stock prices having soared. Like I said earlier, it was widely believed that tax cuts for corporations would lead to increased income for Americans. Now, as the disposable income growth rate is stalling, will those companies do well? It’s very hard to see that happening. Recently, we saw a significant sell-off in the stock markets. Investors are spooked. If the data becomes loud and clear that a recession is nearing, don’t be shocked to see the sell-off become more rigorous. The stock market tends to move ahead of the economy; it sells off before a recession, bottoms at the peak of slowdown, and rallies just as the recovery begins. 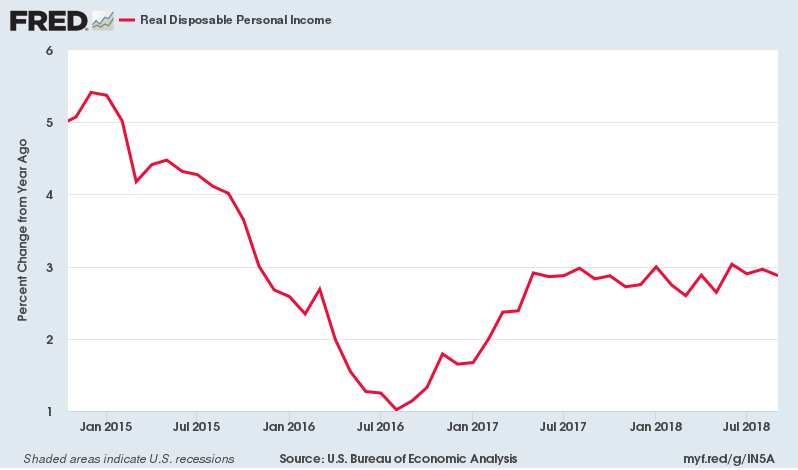 Personal disposable income is just one data point saying problems could be ahead. The total list of indicators continues to get bigger.